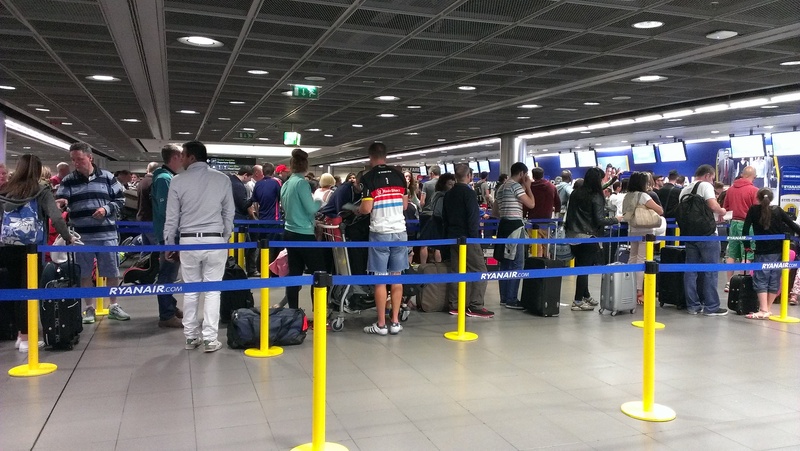 believe how many other people were also awake, on the streets and in the airport lines. The weather in Edinburgh was horrendous when I got there, but thankfully the plane landed without issues. I tried to keep my spirits up as the bus took us to Old Town. My socks were sopping wet within a couple minutes of walking around, and the wind rendered my umbrella useless. I began to feel like the whole trip was going to be miserable, so I headed straight for the hostel. 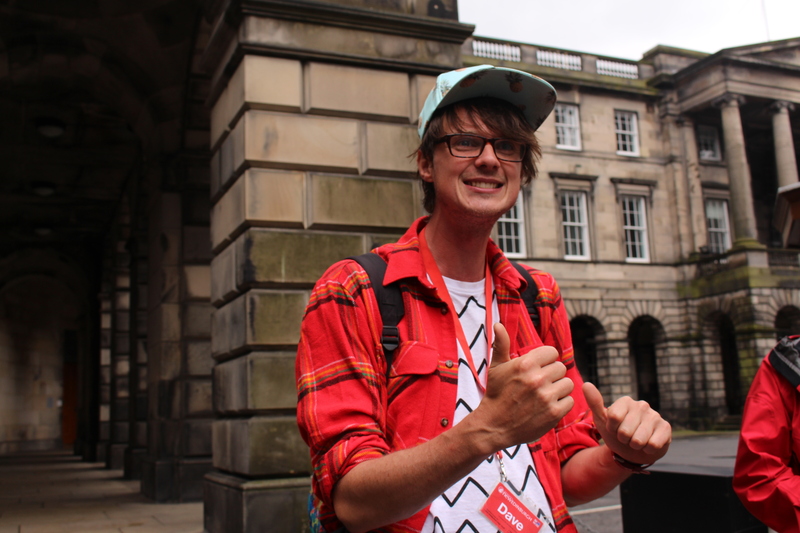 The hostel receptionist recommended a free walking tour that would happen rain or shine. The tour guide, Dave, was super enthusiastic and told great stories. The stories! He told us of Robert Bruce’s heroics against England’s larger army, Robert Louis Stevenson’s real-life inspiration for Dr. Jekyll & Hyde, Edinburgh Castle’s purpose, JK Rowling’s inspiration for Hogwarts (Edinburgh Castle + George Heriots School), Greyfriar’s Bobby (doggy!) and the college kids who stole the Stone of Destiny from Westminster Abbey. Cool stuff! After the tour, I had cod fishcake with salad at the National Museum cafe. It was pretty good, though I felt bad for not eating at a more traditional restaurant. At least I got to traipse up and down the different levels of the museum before I had to go on the Edinburgh Castle tour. Dave was the guide again, and he told us more stories about Scottish heroes who defeated Napoleon’s army, the story behind a controversial general’s statue, daring prison escapes, the one o’clock cannon, the takeover of Edinburgh Castle by Robert Bruce’s nephew, as well as the Black Dinner, which inspired the Game of Thrones’ Red Wedding. 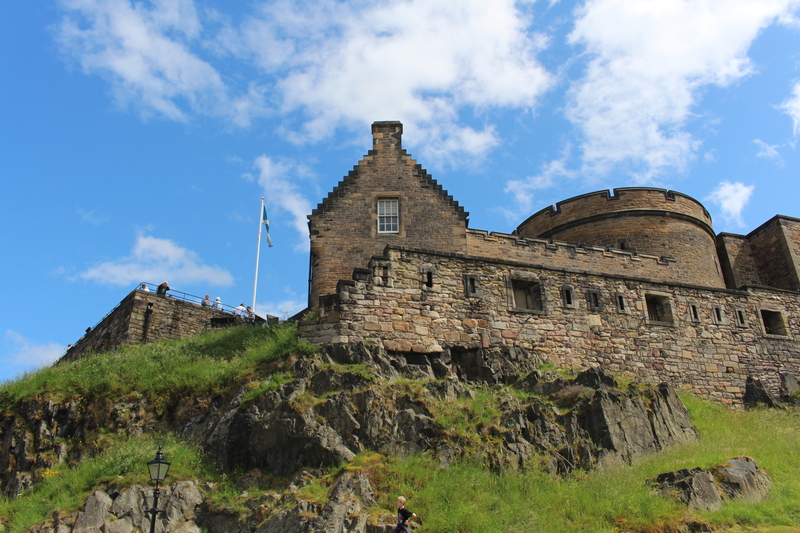 The castle is such an important part of Scottish history. The view of Edinburgh from up high was also amazing. pop drink, Irn Bru. 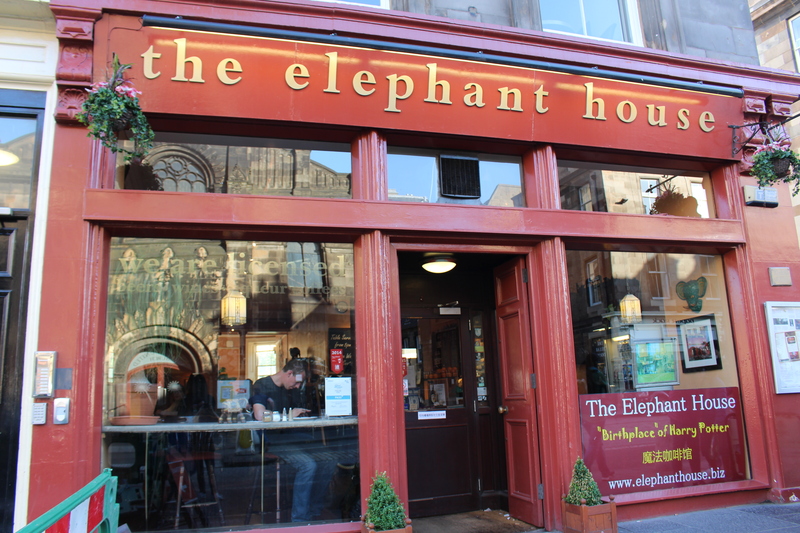 Took pictures of the rest of The Elephant House, even the bathroom. People have written all over the walls, praising Harry Potter and JK Rowling. After dinner, I left the cafe and wandered around the city for a bit. I sat in the common room for a while reading Hunger Games A-Z until I got kicked out. Didn’t get to eat haggis but saw this take-away place with cheap haggis so will eat there tomorrow. Woke sort of early today to walk around the city some more. I figured I would visit the free museums on the Mound, but they didn’t open until 10 am so I just walked to the nearby Walter Scott park. There’s even a huge monument erected for him in the middle of the park. The National Gallery which turned out to be a bunch of artwork, which I was a bit too tired to appreciate. I was really looking forward to seeing the Writer’s Museum but it turned out to be closed on Sundays, as were a bunch of other museums. So I went back on the Royal Mile and decided to walk down to the Museum of Edinburgh and Scottish Parliament. On the way there, I found this homey cafe that sold haggis rolls and baked potato. I talked to the cafe girl and vowed that I would be back later. She didn’t seem to believe me. 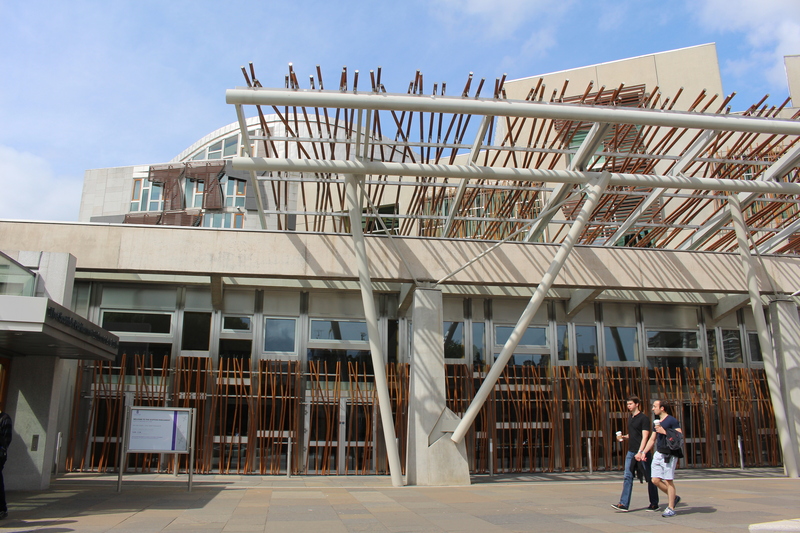 Museum of Edinburgh was closed, so I went on to the Scottish Parliament. It turned out to be modern and pointy, not an old as I expected. There was a great view of Holyrood Park, but I was too tired and pressed for time to attempt a climb to Arthur’s Seat. There was a palace nearby with a bunch of tourists crowding around, so I went to have a look. Turns out it was Holyrood Palace, where Queen Mary of Scots used to live and where Queen Elizabeth was staying up until yesterday morning! stuffed, but finished most of it anyway. The haggis was actually not too bad, just tasted like meat. But I survived it! I also survived the bus ride back to Edinburgh Airport and the flight back to Dublin. Today at work I analyzed the New York Times’ super cool “Snow Fall” multimedia story. I also pulled together lots of different stories about Tinder and created a mock story on its pros and cons. Pretty productive day. It was sprinkling back at home, but I decided to go out for a solo run and look for photo opportunities. 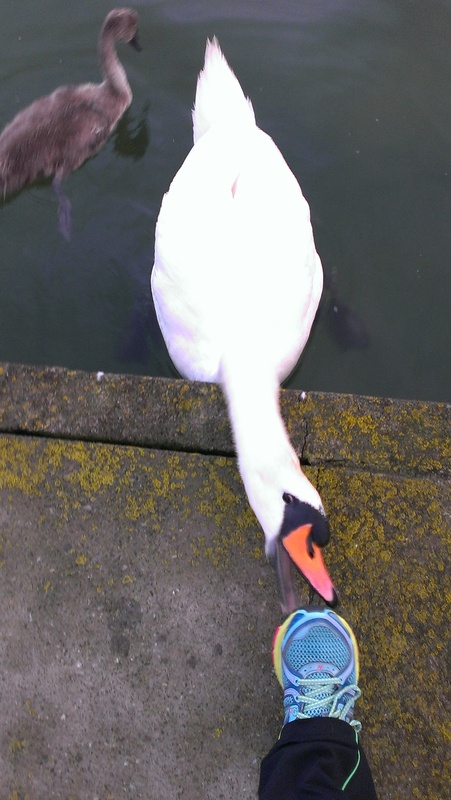 I got some cool shots, but my favorite was the moment a swan swimming in the on-campus lake snapped at my shoe. It also bit my finger and drew blood. Swans are pretty vicious. When I told my editors what happened to me and the attacking swan, one of them commented, “that’s the most American thing I’ve ever heard.” Hahaha. My co-intern wanted to do research old architecture in the National Architecture Archives, which was next to Merrion Square. We walked twenty minutes in the rain and wind to get there. 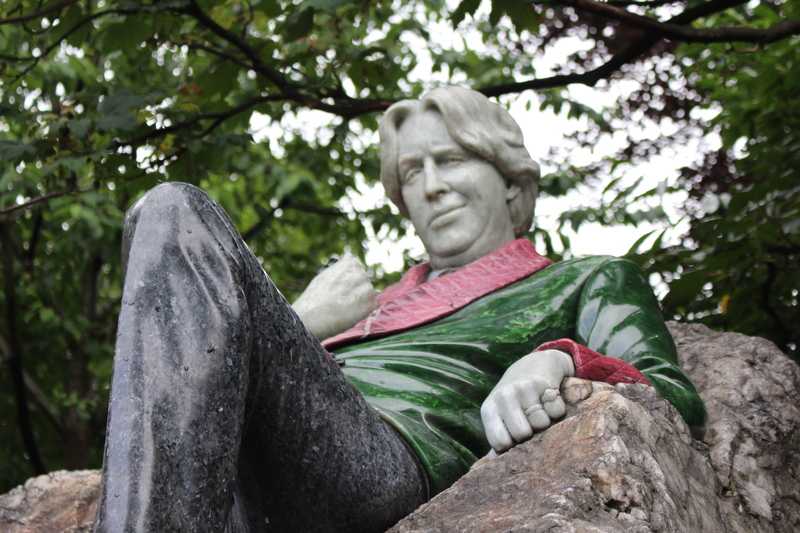 After my co-intern finished her research, we hung out in Merrion Square and took pictures of Oscar Wilde. There was also a great playground with a giant swing. We then pored over books in the Eason bookstore, and I picked up dinner at KC Peaches. Back at home, I attended a singing session on campus where we learned the first two stanzas of “Auld Triangle” with harmony, got free Red Rufus sock cats, and sang solos for “Molly Malone.” Hit the gym afterwards with my friends and had a good run on the treadmill. Work was a bit slower today, but I got some stuff done. There was a movie event tonight back at UCD, so I walked to the on-campus cinema with my friends. When we got there, the room was empty and we thought it was cancelled. The receptionist said she could play it for us, so we took our time getting snacks first. We then watched Calvary, just us in a big empty room. It was gloomy and depressing, with lots of commentary about religion and beautiful Western Ireland scenery. interior of an on-sale house. 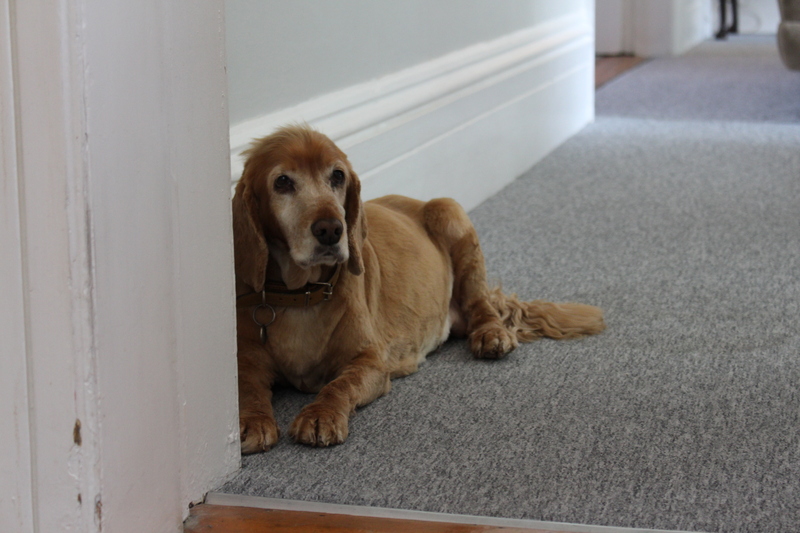 It would have been a dull trip if the owner didn’t have two adorable cocker spaniels who were super friendly. One was young and kept jumping on us and licking our faces. The other was older and farted around us. My friends and I went to look for a pub afterwards, and we first hit this pub that was so tight-knit and cozy that we seemed so out of place. Plus there was no food. So we got drinks at the Brazen Head instead, which happens to be the oldest pub in Dublin. The live music was amazing, and we heard more good songs like “I’ll tell me ma,” “Dirty Old Town,” “Foggy Dew,” Irish Rover,” etc! Got a baked potato for lunch after class and met up with everyone for our afternoon excursion, which for today was the National Museum of Archaeology. My friends and I were exhausted, but the coolest part of the museum was the Ancient Egyptian section where they had mummies and hieroglyphics carvings. About to enter a creepy courtyard in Kevin’s Park. Afterwards, we walked to O’Connell Street to buy tickets for the Ghost Bus tour later that evening. Then we had two hours to eat, so we went to the Flanagan’s restaurant next door and ordered some wonderful food. I ordered prawn pasta and my friend got this huge pot of small mussels that looked amazing. Then we got some gelato at the Italian place across the street. I got lemon, but there were so many other flavors I wanted to try. As soon as we boarded the Ghost Bus, a guy jumped out at my friend with a creepy laugh. 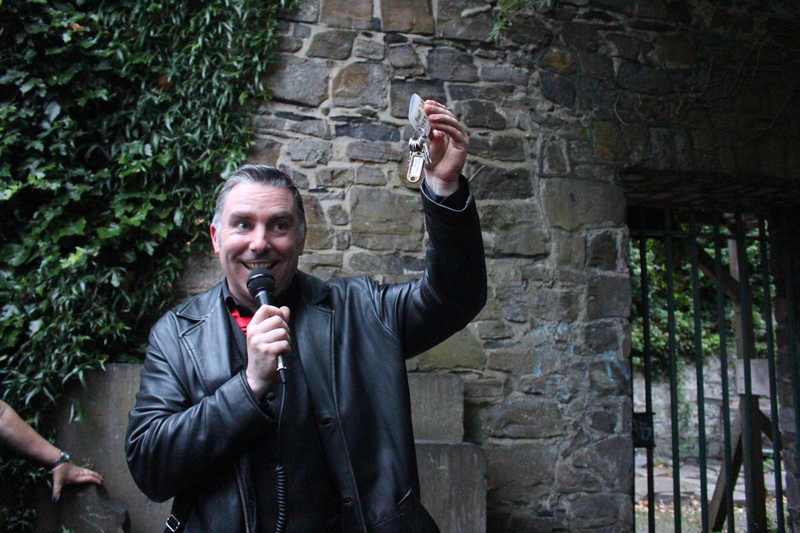 He turned out to be our tour guide and told us scary stories about creepy things that happened around Dublin. He was sort of in our face a lot, dangling rats and fake intestines at us. Our first stop was in the crypts of Christ Cathedral, where the guide showed us torture instruments and told us a true werewolf story. Our next stop was at Kevin’s Park, which was a graveyard turned into a public park. It’s pretty creepy that people actually have picnics there. Our guide gave us a little demonstration of how people used to rob graves by hooking up corpses by the chin. Soooo scary.